While messaging services that are also platforms are nothing new (see Messenger and Slack), new app Cola thinks it can make life easier for users, especially those who don’t want to be tied into a larger social network. Using the chat interface as a medium, Cola keeps its tools social as well. When you communicate with others, asking ‘where are you?’ would allow the person on the other end of the chat to quickly share a map view with their place pinned. 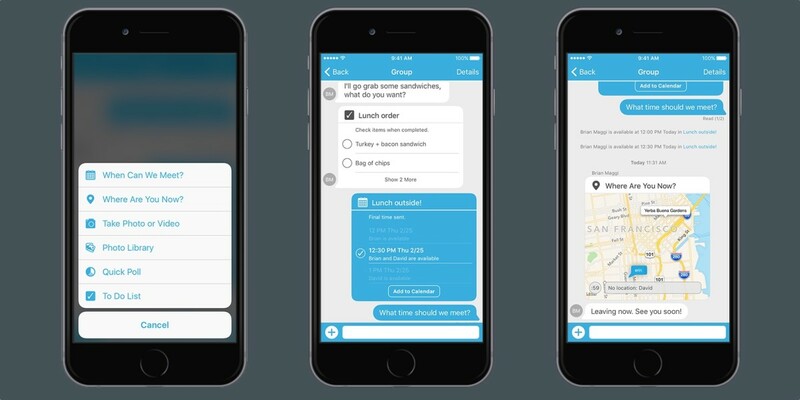 You can also share to-do lists with Cola, and send quick polls to friends. A shared calendar makes scheduling things quick and easy. Cola also supports groups; the same one-on-one functionality noted above can be applied to chats with multiple users. The app may perform slightly different — sharing locations with the group is a full screen view, for instance — but it all works the same. Where Cola stands out are with ‘Bubbles,’ which are interactive chat — well, bubbles — that appear in the stream. Information in those bubbles, like flight information, is updated in real-time. That also means the app has a fluid, familiar UI without a lot of different views to get used to, and you won’t be bouncing around from app to app on your phone. The company says one Bubble can do the job of a dozen text messages. Cola CEO David Temkin says the company policy is “text less, do more,” and it shows. While Cola is in no position to replace all the apps on your phone, it does handle quite a bit of the boilerplate issues you may have when interacting with others. The app is currently only available for iOS. No Android app has been announced.